Gigi Hadid has a complicated relationship with social media. Despite the supportive community of followers that it's granted her — she has 38.9 million Instagram followers, FYI — the 22-year-old model has also spoken out about its harmful repercussions. Gigi is now reinforcing her thoughts about social media with, coincidentally, her latest iPhone case. 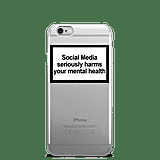 "Social media seriously harms your mental health," states Gigi's Urban Sophistication Mental Health Warning iPhone Case ($35). She was photographed with the case during the most recent Fashion Month and has had it on her phone ever since. If you recall, Gigi actually took a month-long social media hiatus in 2016. "I'm going to take a break when I feel like it, and when I come back and share it with you, if you want to be supportive and still follow me, I'm so grateful for that," she told reporters at a Reebok event. "I'm so grateful for social media because it's given me so much more in my career, but I also really respect my career without the social media aspect." In December 2017, Gigi tweeted that she would be taking a week-long technology break "cause it's good for the soulll." 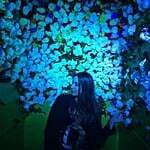 Though it's ultimately a personal choice, a lot can be learned from Gigi's outlook on social media and the healthy distance she keeps from it.